Can it get any better than this? 'Shine On' is simply a work of art, destined to become the 'Picasso' of the garden. 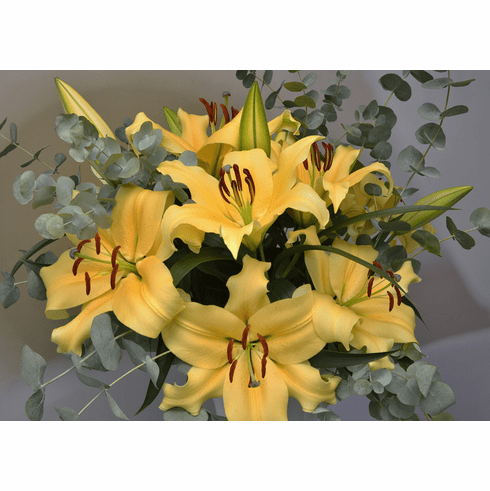 Not quite butter and not quite gold, the soft apricot overtones in cool weather make this lily hard to describe for color. We will let the photo speak for itself. We thought we would never love an Orienpet more than 'Conca d' Or, one of our first Orienpet introductions and still to this day our best selling variety, but 'Shine On' is sure to give 'Conca' a run for popularity. 3 to 4 Feet Plus. Late July / Early August. A scent as wonderful as its beauty.